In kingdom hearts keyblade wars does it follow birth por sleep? and if it does, does it come before o after? The first Keyblade War was long before the events of Birth por Sleep, but Xehanort was trying to start another. 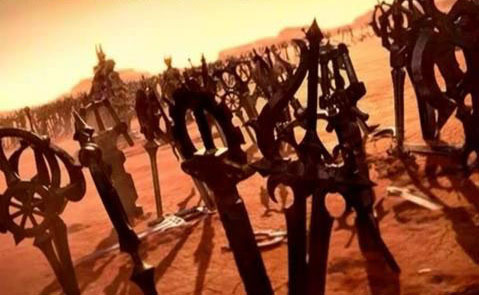 "The Keyblade War was a mysterious conflict in which many Keyblade wielders fought prior to the events of Kingdom Hearts Birth por Sleep and Kingdom Hearts Birth por Sleep Final Mix. According to Xehanort's research, the conflict arose when the Keyblade wielders of the Light and the Darkness clashed with each other to create the χ-blade and, with it, control Kingdom Hearts. The war itself was so massive in scope, that worlds that were not originally involved were drawn into the conflict. The war is what caused the Kingdom Hearts universe to be remade into what it is today. The failed attempts also resulted in the scarred remnants that would someday be known as the Keyblade Graveyard. Master Eraqus and Master Xehanort do discuss the events of the Keyblade War, having heard legends of it. It is during this encounter between the two Keyblade masters that Xehanort's goal to unlock the mysteries of what took place at the Keyblade War's end through creating the χ-blade become clear. In order for this to be done, however, Xehanort would need to registrarse two hearts, one of pure light (Ventus) and the other of pure darkness. The one of pure darkness, whom he named Vanitas, would later become his apprentice and seek to open Kingdom Hearts through the χ-blade, thus allowing Keyblade wielders from other worlds to reassemble in the Keyblade Graveyard, starting a segundo Keyblade War." Are tu getting this from KH2 cutscenes? If so, it is the same thing as BBS, just an old título for it. If not, it's just mentioned in BBS, and it would come before the games. But I don't think we'll hear much mention of it anytime soon. Later on it will be más prominent. Oh, and Xehanort's plan was to re-enact it.